← Who is my Salesforce Account Executive (AE)? I had an interesting inquiry come across our website recently. The individual wanted to know if there was an easy way to email Contacts that didn’t open up his last mass email. Actually there is! As a prerequisite for this to work, the last mass email needed to have used an HTML email template created in Salesforce. First you’ll need to create a Campaign. Let’s call it "Second Pass Contacts." The Campaign Members will be Contacts that did not open the last mass email (hang in there – this will make sense after a couple more steps). Once you’ve created your Campaign, you’ll need to run an HTML Email Status Report. The easiest way to find this report is to go to the Contact tab, then scroll down to the bottom of the page until you see a section called "Reports." There you will see a link to run the HTML Email Status Report. 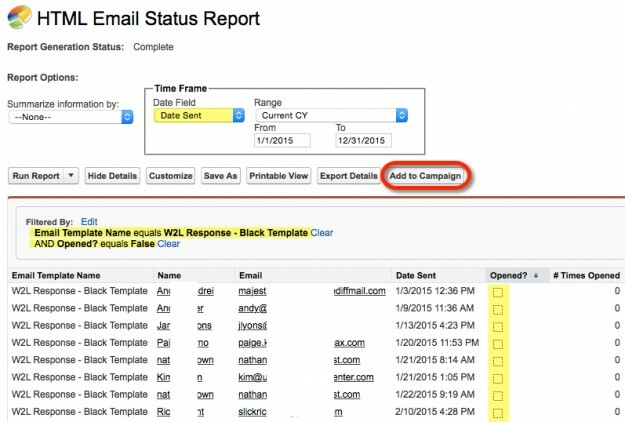 When you run this report you’ll want to filter it down by the Email Template Name used in the mass email and the Date Sent to be sure you’re isolating your Contacts down to the right email blast. Since we’re targeting people that didn’t open the last mass email, you’ll want to filter the Opened? field to equal "False" as in the screenshot below. Now that we have the right Contacts identified, we can add them to the Campaign we created earlier by using the "Add to Campaign" button on the report. 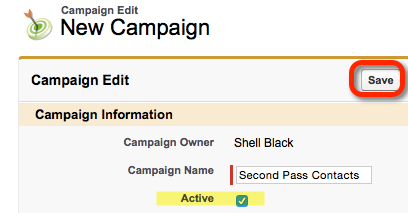 On the next screen you can search for the "Second Pass Contacts" Campaign, set the Campaign Member status to "Sent," then click the "Add to Campaign" button. At this point we can send our Mass Email. From the Contacts Tab, scroll all the way to the bottom of the page until you see the section called "Tools." 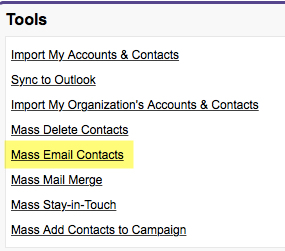 In that section you’ll see a link to "Mass Email Contacts." Click the link to start the Mass Email wizard. In the first step of the wizard, click the link to "Create New View." 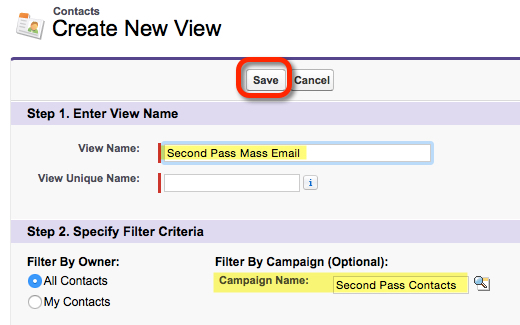 When you create your view you’ll need to give your view a Name in Step 1, then instead of writing a set of filters in Step 2 you simply choose your "Second Pass Contacts" Campaign to grab your Contacts – sweet! You’ve just targeted all the Contacts that did not open your last mass email. On the next step of the wizard you can choose the Email Template you want to use and send your email blast!